The Bariatric 600 series is constructed to provide optimal pressure redistribution and support for the high risk bariatric patient. 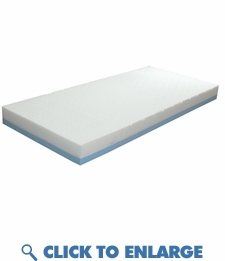 This pressure reduction mattress was designed utilizing a combination of the highest density foams to create the quintessential sleeping surface for the heavier patient. This bariatric foam mattress is comprised into multi foam layers that relieve painful pressure points supporting up to 1000 lbs. This bariatric pressure relief mattress is not only designed with patient comfort in mind but it will prevent and heal up to stage 2 bed sores and pressure ulcers. The 54" width fits a full size box spring or standard medical bed frame. This bariatric pressure relief mattress is available in 76" , 80" , and extra long 84" lengths. The heel section uses aerated foam which allows air to continuously pass thru keeping the patient cool and dry. CAL Fire rated foam 16 CFR part 1632 & 1633. Top-layer of high resilient high density die cut foam provides optimal support and comfort. Heel section is made of Lura-Quilt� foam. It is an aerated foam which allows air to continuously pass thru keeping the patient cool and dry. Bottom layer of foam is constructed of ultra high density high resilient foam which provides unprecedented patient support and stability. The top of the cover is a four way stretch nylon material with a low moisture vapor transmission rate. Water resistant anti-microbial/bacterial cover is perfect for infection control. Anti-Contamination Flap covers the zipper reducing the possibility of fluids contaminating the foam core. 16 CFR part 1632 & 1633.